Not used for purposes of Assessee’s Business or Profession. House Property situated in a Foreign Country. The income from houses, buildings, bungalows, godowns etc. is to be computed and assessed to tax under the head “Income from house property”. The income under this head is not based upon the actual income from the property but upon notional income or the annual value of that building. 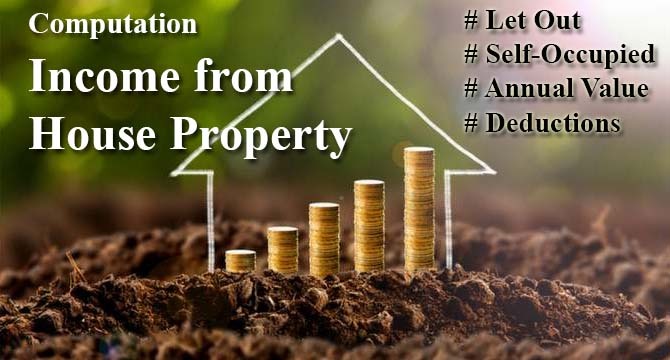 The annual value of property consisting of any building or lands appurtenant thereto of which the assessee is the owner, other than such portions of such property as he may occupy for the purposes of any business or profession carried on by him the profits of which are chargeable to income-tax, shall be chargeable to income-tax under the head ‘Income from house property’. 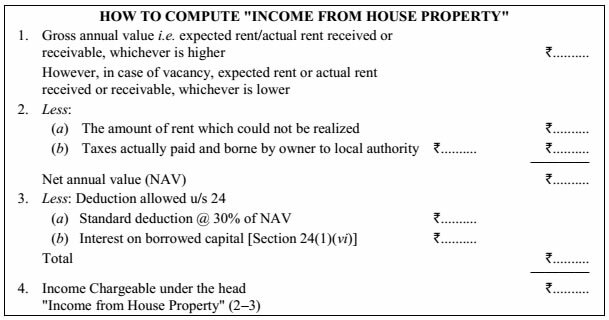 For income to be taxed as ‘Income from house property’ the following points should be noted carefully. Building or Land Appurtenant thereto. The scope of this head of income is limited to the income from buildings or lands appurtenant (attached or situated in the vicinity of building) to buildings only. Buildings include residential houses, bungalows, docks, warehouses, any block of bricks or stone work covered by a roof etc. Land which is not appurtenant to any buildings does not come within the scope of this section. Annual Value. The meaning of word ‘Annual value’ is very significant because the annual value of the building or land appurtenant thereto is to be taxed and not the rent received. 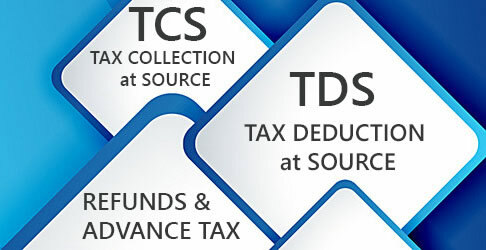 The annual value is to be determined according to the provisions of section 23 of Income-tax Act. These are discussed later in this chapter. The Assessee should be the owner of the property. It is only the owner of the house property who can be taxed under this head of income. The tax under this section is in respect of the legal or beneficial owner and not the occupation or possession of house property’. Therefore, income from subletting, will be chargeable under the head ‘Income from other sources’ and not under house property’. So only the owner, may be legal or deemed owner, is liable to tax under this head of income, unless the house property is used by him for the purposes of his own business or profession. If the land was taken on lease (long time) and a super-structure constructed, the person who takes land on lease will be treated as its owner. Where the property is mortgaged, it is the mortgager alone and not the mortgagee who can be treated as the owner. Where the property was constructed in the name of partnership, it is the firm which is assessable as owner and not the individual partners. A person whose property is vested in the Custodian of Evacuee Property is not the ‘owner’ thereof for the purposes of this section. 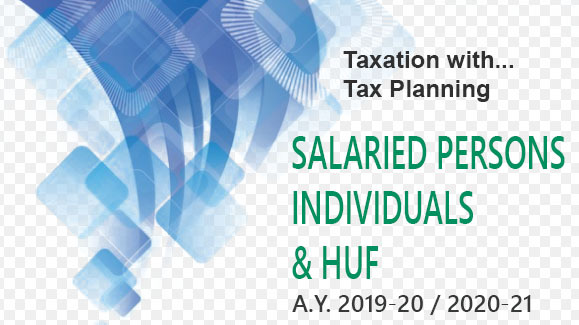 Where the assessee takes a building on lease and he is deriving some income by subletting or re-letting, this income will be taxable under the head ‘Income from other sources’ and not under the head ‘Income from house property’. In case houses were constructed by a cooperative building society and allotted or leased out to its members, the member shall be deemed to be the owner of the buildings or part thereof, as the case may be. In one of the cases, Supreme Court decided that the owner must be a person who can exercise the rights of the owner, not on behalf of the owner but as his own right. An individual who transfers otherwise than for adequate consideration any house property to his or her spouse, not being a transfer in connection with an agreement to live apart or to a minor child not being a married daughter, shall be deemed to the owner of the house property so transferred. The holder of an impartible estate shall be deemed to be the individual owner of all the properties comprised in the estate. A member of a co-operative society to whom a building or part thereof is allotted or leased under a house building scheme of the society, shall be deemed to be the owner of that building or part thereof. A person who is allowed to take or retain possession of any building or part thereof in part performance of contract of the nature refered to in section 53 A of the transfer of property Act, 1882. A person who acquires any rights (Excluding any rights by way of a lease from month to month or for a period not exceeding one year) in or with respect to any building or part thereof, by virtue of a transfer by way of lease for a term of not less than 12 years as per Section 269 UA (f) (whether originally or by extension). 3. Not used for purposes of Assessee’s Business or Profession. Where the assessee is carrying on business or profession in his own house, building or in a portion of it and the income of such business or profession, is taxable under the head ‘Profits or gains of business or profession’, the annual value in respect of property or portion of it is not taxable under this head of income. As the business is being carried on in the assessee’s own premises, so no rent will be allowed as expenditure to the assessee in respect of these premises. But where the profits of such business or profession are not chargeable to tax, the annual value of the (owned) premises shall be computed and charged under the head ‘house property’. X owns a property. He uses the property as his office, factory or godown. As the property is used for the purpose of carrying on own business or profession, nothing is taxable under section 22. X Ltd. is a manufacturing company. The factory of the company is situated in Andhra Pradesh. Within the factory campus, there is a residential colony having 80 quarters for workers. These quarters are given to the workers for residential purposes. A nominal rent of Rs. 100 per month is recovered from the workers. As the purpose of letting out of residential quarters is to run the business smoothly, the residential quarters will be treated as house property used by the assessee for the purpose of its business. Accordingly, annual value thereof is not chargeable under section 22. Recovery of rent of Rs. 100 per month from the workers will be taken as business receipt. Y Ltd. makes available a few rooms in its factory on nominal rent to the Government for locating a branch of nationalised bank, post office and central excise office for carrying on its business efficiently and smoothly. Nothing is taxable under section 22. Rent collected, being incidental to the business of Y Ltd., is assessable as business income under section 28. OWNERSHIP- If title of ownership of a house property is under dispute in a court of law, the decision about who is owner rests with the Income-tax Department. Thus, mere existence of dispute as to title cannot hold up an assessment even if a suit has been filed. Generally, the person who is in receipt of income or the person who enjoys the possession of a house property as owner, though his claim is disputed, is assessable to tax under section 22. 5. House Property situated in a Foreign Country. In case an assessee who is resident of India owns a house in a foreign country, income from such a house is taxable in India under the head house property. So income from house property in case of 'Not Ordinary Resident' and a 'Non Resident' shall be exempted but again it will be taxable in India if it is received or it is payable in India. If the owner of a house property gets a composite rent for the property as well as for services rendered to the tenants, composite rent is to be split up and the sum which is attributable to the use of property is to be assessed in the form of annual value under section 22. The amount which relates to rendition of the services (such as electricity supply, provision of lifts, supply of water, arrangement for scavenging, watch and ward facilities, etc.) is charged to tax under the head “Profits and gains of business or profession” or under the head “Income from other sources”. X owns a property. It is given on rent to Y. Y annually pays Rs. 1,00,000 as rent of the property and Rs. 20,000 for different services like lift, security, air-conditioning, etc. In this case, Rs. 20,000 is not taxable in the hands of X as income from house property. Rs. 20,000 would be taxed in the hands of X after deducting his actual expenditure for providing different services (lift, security, air-conditioning, etc.) as income from other sources or as business income. If there is letting of machinery, plant and furniture and also letting of the building and the two lettings are inseparable (in the sense that letting of one is not acceptable to the other party without letting of the other), then such income is taxable either as business income or income from other sources. This rule is applicable even if sum receivable for the two lettings is fixed separately. X owns an air-conditioned furnished lecture hall. It is let out, annual rent being Rs. 5,00,000 (it includes rent of building and rent of air-conditioner and furniture). In this case, letting of lecture hall is not separable from the letting of airconditioner/furniture. 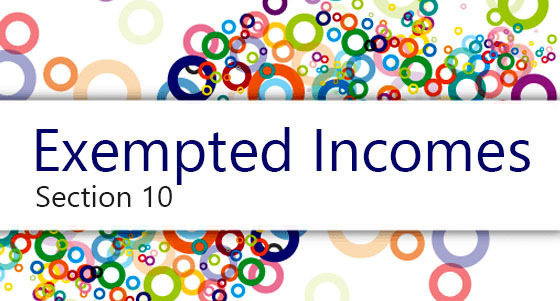 This income (after excluding expenditure) is taxable as business income or as income from other sources. If there is letting out of building and letting of other assets and the two lettings are separable (in the sense that letting of one is generally acceptable without letting out of the other; for instance letting out of building along with car), then income from letting out of building is taxable under the head “Income from house property” and income from letting out of other assets is taxable either as business income or income from other sources. This rule is applicable even if the assessee receives composite rent from his tenant for two lettings. X gets Rs. 20,000 per month as rent from Y for letting out of a building and a car [the two lettings are separable in the sense that Y was given an option to take on rent either the building (at Rs. 16,000) or the car (at Rs. 4,000) or both]. The rent of the building is taxable under the head “Income from house property” and the rent of car is taxable either as business income or income from other sources. one self-occupied property [sec. 23(2)].